When you think of mid-90's emo bands, names like Braid and The Get Up Kids come to mind. Along with these bands, The Jazz June has to pop into your head. After forming in 1996 and releasing numerous records, the band broke up after 2001's Better Off Without Air. Members went on to form other bands, and it seemed as if The Jazz June would end of as a small footnote in music history. However, the band has recently decided to hold a reunion show to benefit their roadie who has been diagnosed with cancer. Scene Point Blank's Cory caught up with the band to discuss the reunion show, and see what they have been up to since their breakup. 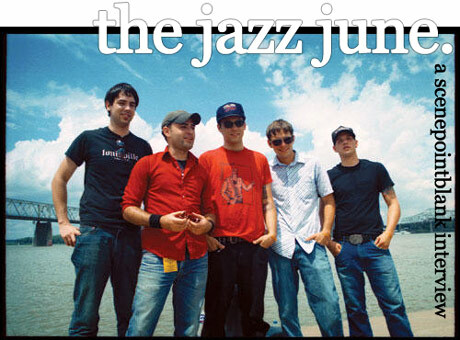 Scene Point Blank: It's probably appropriate to start the interview off by letting those that don't know that The Jazz June is playing a reunion show in Philadelphia in mid-January. How did this all come about, and did everyone feel like it was time to get the band back together? Bryan: We are reuniting because our roadie Adam Gerhart needs our loving support. Adam has been diagnosed with brain cancer and we are getting back together to raise some dough to help him and his wife through this heavy time. The Jazz June have remained very close friends over the years and we have never had more of a reason to get back together than for Adam. Anything that we can do as a collective to help Adam, we will do! Cancer is a real fucker, and we are going to use our music to help drive it from Adam's brain. Andrew: We had been toying with the idea, but everyone was so busy with new babies that it probably wouldn't have happened for a while. We had talked about maybe starting to practice in the summer of 2007. We had been getting a lot of messages from people on our Myspace site asking for a reunion, so we figured why not. The idea was to do a few weekend shows and hit Philly, NYC, Boston, and our favorite city Detroit. Scene Point Blank: Has practice started yet for the reunion show? How much, if any, rust was there, and if you haven't practiced yet what are the expectations? Bryan: Practice has started at home. The setlist is loaded into my iPod and the shredding has begun. Expect a great show. We are also working on having the show video taped with the thought of releasing it on CD and DVD, with the thought of having all of the proceeds generated from CD/DVD sales going to Adam. I am hammering out the details. Andrew: Dan, Bryan, Justin and Jim live near each other, so they have gotten together. I live all the way up in North Jersey, so I will only get together with the band a few times before the show. I will be doing a lot of practicing at home with my acoustic guitar in front of the computer - I don't have a stereo. I do actually know what all the notes on the guitar are called now, so I'm going to make a cheat sheet. The lyrics will be hard. I used to have this thing where I didn't want anyone to know what the lyrics to the songs were, so a lot of them are not in the CD. This was a good call considering how bad some of them are. Scene Point Blank: The show in January is a punk raffle type show to help your roadie Adam in his fight against brain cancer. Along with your band playing, labels like Dischord, Buddyhead, and Jade Tree have also agreed to help. It seems like sort of an odd grouping of people, how did everyone collectively come together? Bryan: I sent some emails and made some calls to labels that were up and coming when we were playing in the late 90's, all of the labels graciously made donations. I reached out to Ian MacKaye of The Evens and he suggested the raffle idea to me, then I ran with it. We received some awesome records from all the labels. And Siren Records in Doylestown, Pa offered gift cards to raffle off. Posted Aug. 6, 2007, 1:47 p.m.